2 drawings on paper : ink ; top image 5.125 x 6 in., bottom image 4.375 x 6 in., on sheet 9.5 x 6 in. Ink sketches of camp life. Top sketch of six men listening to phonograph ; Reverend Matsui reclines on bunk in foreground reading, while three men sit in midground, including M. Shoda and S. Fujita ; two men stand at back near phonograph. 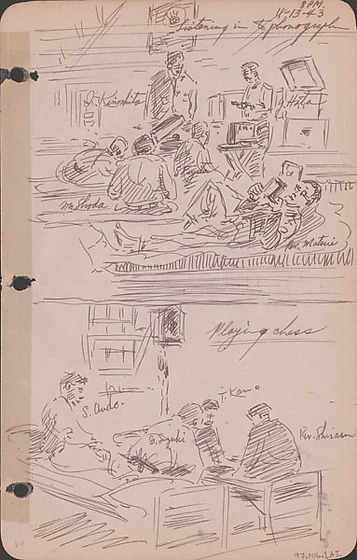 Bottom sketch of two men, T. Kanno and Reverend Shirasu, sitting on a bed playing chess while two other men watch from next bed, G.Suzuki sitting, S.Ando reclining ; window in background. Drawing 97.106.1AJ on verso of same sheet. Written in black ink on top image, top right corner: 8PM / 11-13-43 / Listening in to phonograph Written in black ink on top image, on individual men (from top, clockwise): I. Kinishita, Y. Hata, S. Fujita, Rev. Matsui, M. Shoda. Written in black ink on bottom image, top right: Playing chess. Written in black ink on bottom image (left to right): S. Ando, G. Suzuki, T. Kanno, Rev. Shirasu.